Used 2014 Chevrolet Express Passenger AWD 1500 135" LT for Sale in St. 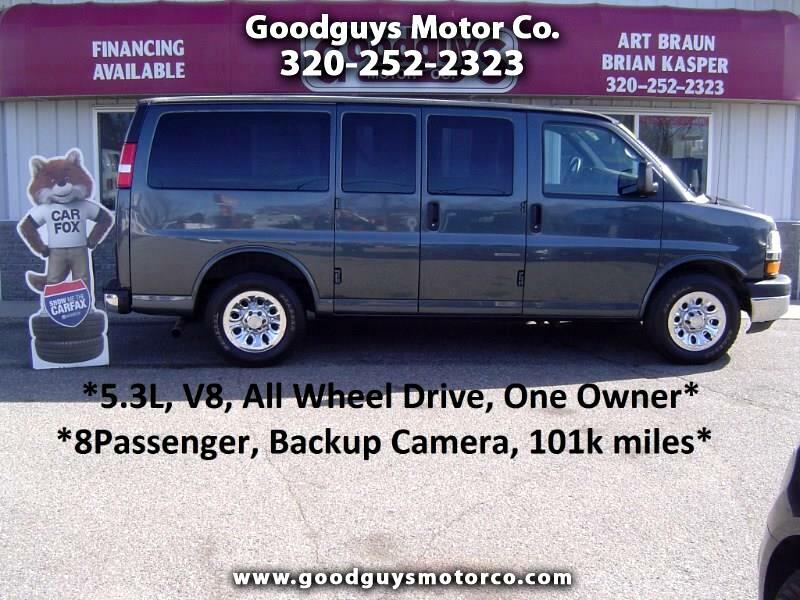 Cloud MN 56301 Goodguys Motor Co.
2014 Chevy Express 1500 AWD -->One-Owner, All Wheel Drive, 8 Passenger!! This One-Owner Chevy van has been fully serviced at Goodguys Motor Company and is ready to hit the road. Features include: 5.3L V8, automatic transmission, air conditioning, AM/FM/CD stereo, daytime running lights, auto headlights, keyless entry, power windows, power locks, AUX input, tilt wheel, cruise control, rear a/c control, info center, backup camera, & traction control. Also included is a 30 day or 1,000 mile Powertrain warranty (work must be done in our shop). Don't let this one pass you by.. Give us a call or stop in for a test drive! Message: Thought you might be interested in this 2014 Chevrolet Express Passenger.